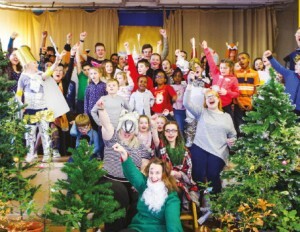 Around 50 members of 4th Portsmouth BB and 8th Portsmouth Girls’ Brigade took part in the event at their church which featured lots of fun and games based around the children’s fantasy story, part of the Chronicles of Narnia, by C.S. Lewis. The children who attended pretended to be Second World War evacuees at a 1940s train station before arriving in Narnia where they joined Prince Caspian and some of Narnia’s talking animals in defeating the evil King Miraz. Leaders from BB and GB wore themed fancy dress and part of the church building was decorated as the station and another part as the magical land of Narnia - complete with castle ruins and trees. Games included dressing up as warriors, morse code message translating, and hide and seek of Narnian characters. The children and young people, aged four to 18, then enjoyed dinner before those aged under eight went home. The over-eights watched the Prince Caspian film before sleeping over and attending a special church service the following morning. The event was the sequel to a previous Narnian activity day and sleepover organised last year by the groups themed The Lion, The Witch and The Wardrobe.